I have to confess, we just had ourselves another "chain reaction weekend". What, pray tell, is that you wonder? A "chain reaction weekend" is one in which a seemingly simple solitary home improvement project snowballs into an endless link of other closely related projects, until you look up at 8:00pm on Saturday night and wonder where the entire day went. Our story begins early Saturday morning, when we decided after 11 years in our house, it was time for a new kitchen faucet. That meant cleaning out under the sink to get to the hot and cold water pipes, which meant we had to clean and organize everything under the sink after the fact. Once the faucet was installed, I realized the white sink looked dingy next to its silver shiny faucet-y surface, which then led me to clean the sink until it shone like the top of the Chrysler building. You know what a shiny sink with a spanking new faucet will do? That's right, make your counters and cupboards look dirty. Deep cleaning the counters led me to the glass stove top, that led me to clean the oven... that led me finally to the microwave... which made me stop dead in my tracks. We have a white kitchen with white appliances. Our white microwave is right over our white stove... though I realized right at that very moment, the grill had not been cleaned in a really long time. 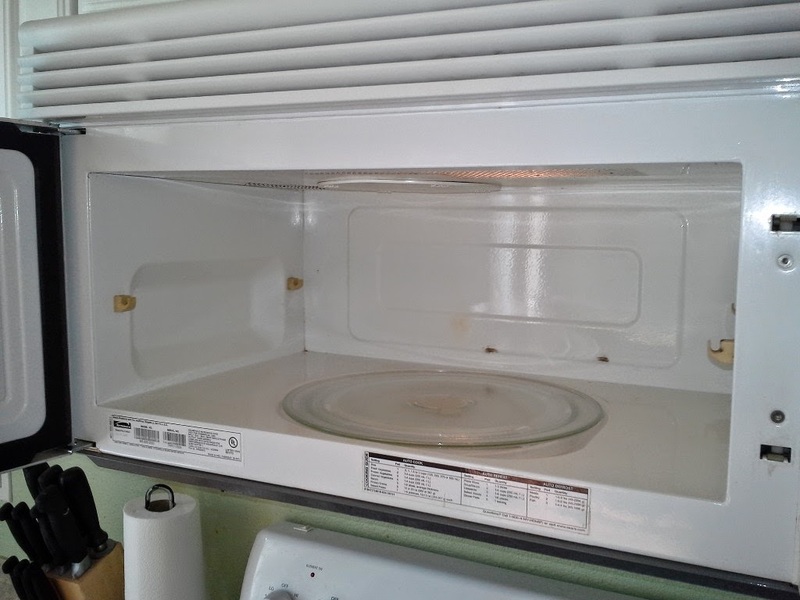 The following post and pictures are going to be shocking... but rest easy though, I'm going to tell you how to clean your decade old microwave to look almost brand new! 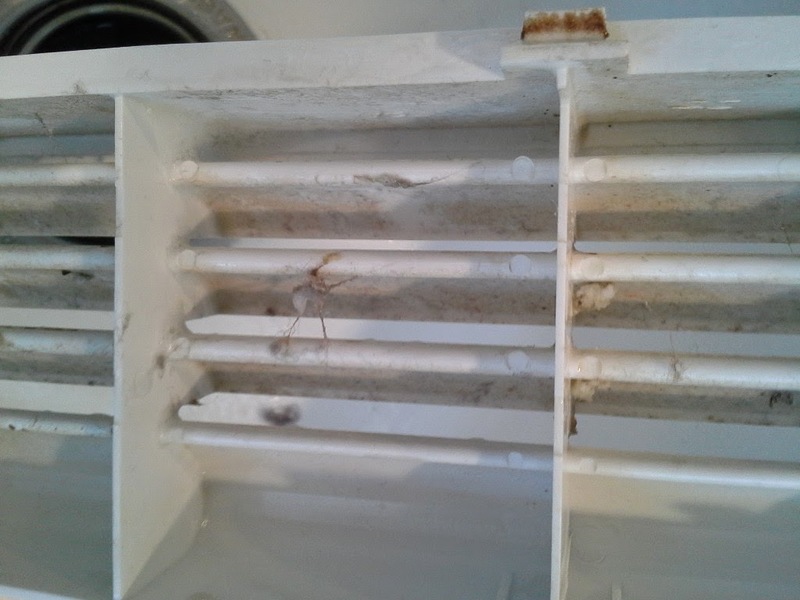 Okay so if you are reading this on your lunch break, or having a late night snack while perusing the interwebs, I must beseech you, these next few pictures of my pre-rescued pre-cleaned microwave are down right gross. Put your food down before preceding. Shield the eyes of the young ones. Those that are pregnant or may be pregnant and/or victims of a weak gag reflex feel free to brace yourselves now. In our defense, we always clean the glass, the handles, the buttons, and the inside of the microwave all the time. 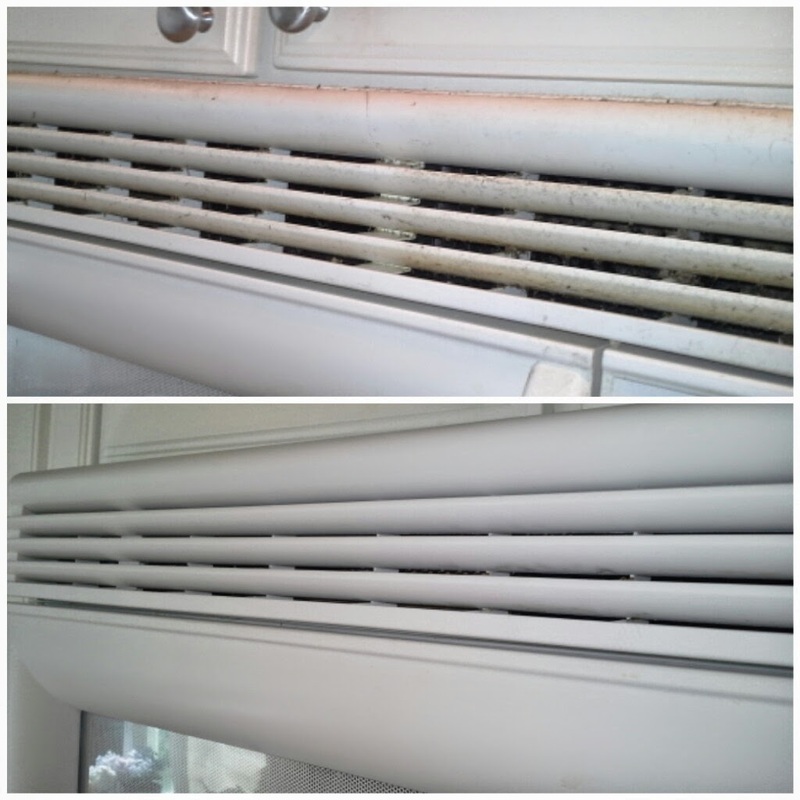 What we rarely (if ever) have cleaned was the grill/vent ABOVE the microwave. At times I would remember trying to wipe the surface down during regular kitchen cleaning, but it was like baked on oil fuzz that stuck like glue. In my busy life it was just one of those battles I did not have time to conquer in the middle of getting dinner on the table. Ug. So so SO gross. I went on the interwebs and the youtubes (I personally like saying them better with "s's") and found there are about 1 billion ways to clean these puppies. What I wanted was the most efficient, and easiest way to make this look like new again. First of all, did you know for example, that you can REMOVE this grill? Say wha? That's right, on top of most microwave grills are a few screws you can remove with a Phillips head screwdriver. screws along the top of your microwave... who knew?? Obviously I am not 7 feet tall and never had a clue in the world that there were screws on top of my microwave (nor a thick layer of dirt grease). So I had my hubby remove all the screws and with a quick slide to the left, the whole thing popped off! 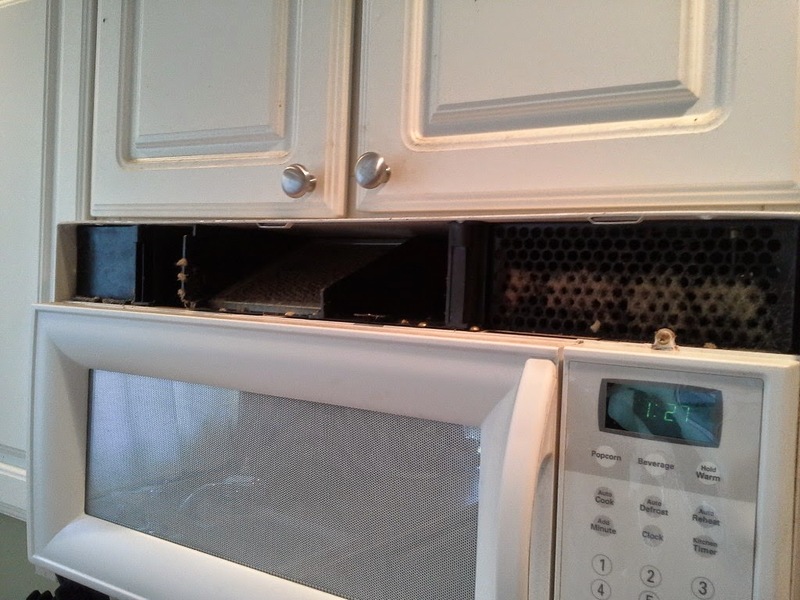 (Note: once unscrewed, it is easier to pop this grill of with the microwave door still open). What was I going to find behind that grill? Narnia? A bird nest? A pile of hidden $100 bills from the builder? Nope, just a dark opening... oh but guess what else? 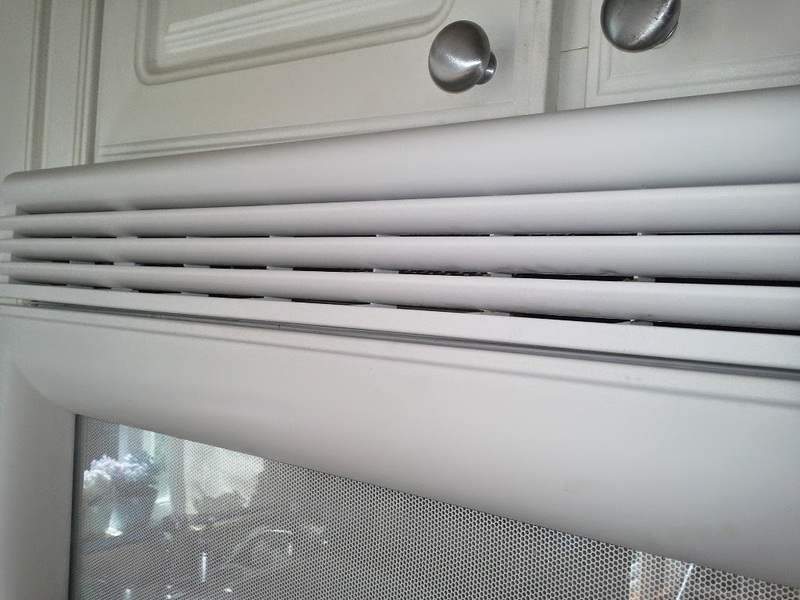 Not only did we get the grill off, but we did so, we were COMPLETELY surprised to find out that there is a FILTER inside the microwave slot that also needs cleaning. Say what wha?? 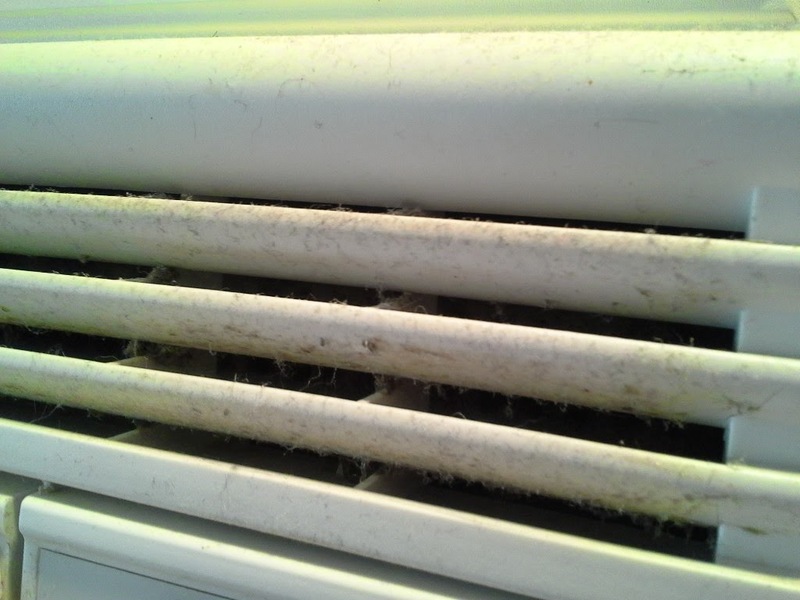 This is right up there with my zero gag tolerance for mold and hair... the sight of this filter here almost did me in. If you are feeling "the vapors" by looking at this pic, hold on to something steady because I promise you are going to freak out at how clean and shiny we are going to make this thing!! Okay so back to the grill I placed half of it in my sink and thought, this is stuck on grease, I need a de-greaser. The interwebs had a number of home remedies but I thought I would start with the easiest. My Lysol antibacterial kitchen spray cleaner, which is also a de-greaser would be my first attempt. I figured if it didn't work out I would move on to the "bigger guns". I sprayed half that grill down good and let it "soak" in the juices for a few minutes. Wouldn't you know it, but I started to see the stuck on grease start sliding off the grill into the sink. On my first try? Sa-weet! I got out our trusty, older, just for cleaning toothbrush and scrubbed half of it and rinsed it off with hot water. You also have to flip it over and scrub the other side, which also has many nooks and crannies of grossness. 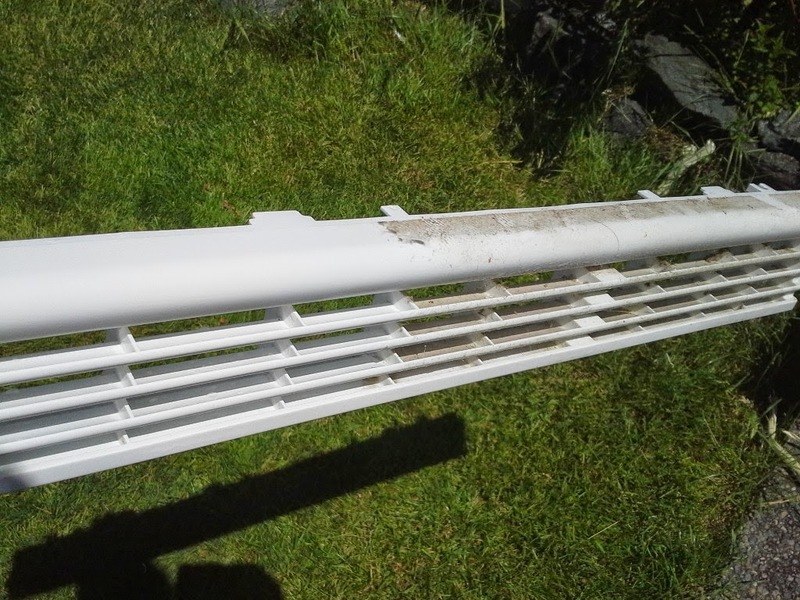 After more Lysol, hot water, a toothbrush, and even some Q-tips in the tight spaces, I could not believe how awesome half of the grill looked. I was actually giddy about this astounding change. half in light, half in "darkness"
Talk about a life-altering improvement! We went to work on the other half of the grill and it went from zero to hero in about 30 minutes flat. We let it sit out in the sun to dry off but WOW, what an amazing difference. By the way, those nasty filters? Well did you know that there are two more of them UNDER the microwave for a total of three? 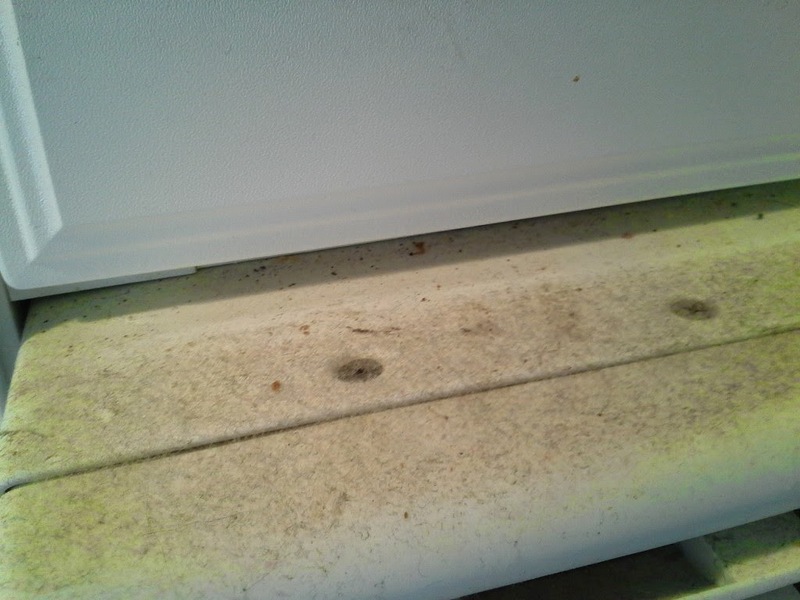 They catch quite a bit of grease from your stove top and were also in desperate need of a deep cleaning. We popped all of them out and went a Googlin' to see what could be done. There were vinegar dip methods and steam methods, but the easiest suggestion was to pop them in your dishwasher and BAM... a miracle would happen. Holy cow... now that is CLEAN! It's like a heavenly light is shining down, and the microwave angels start to sing hallelujah kind of clean. It was amazing!! From sickening to spectacular after one buzz through the dishwasher. It was fabulous. 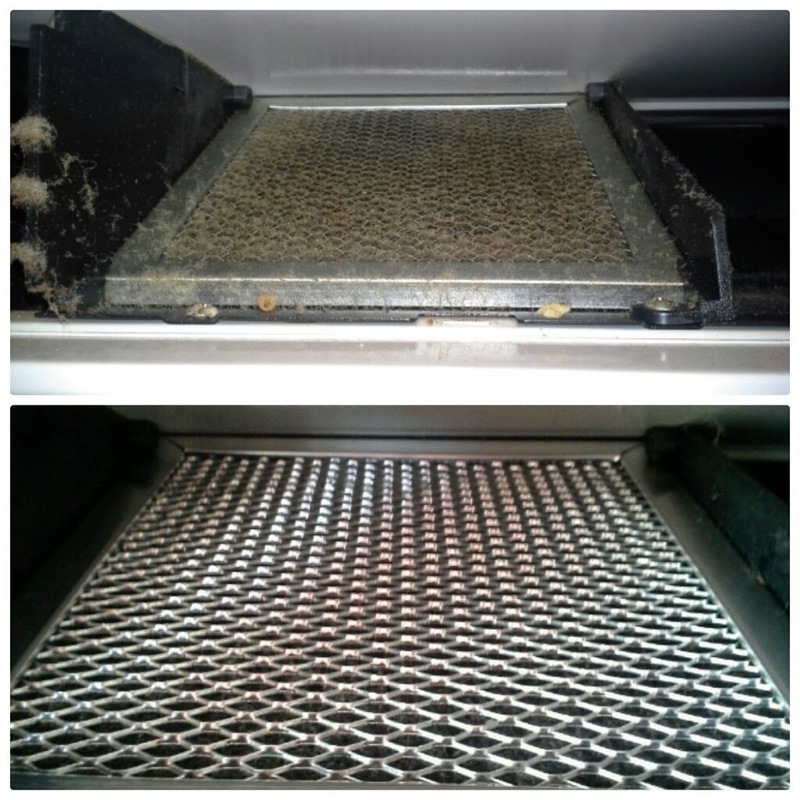 The two filters below the microwave also came out spanking clean as well. Like new I tell ya! 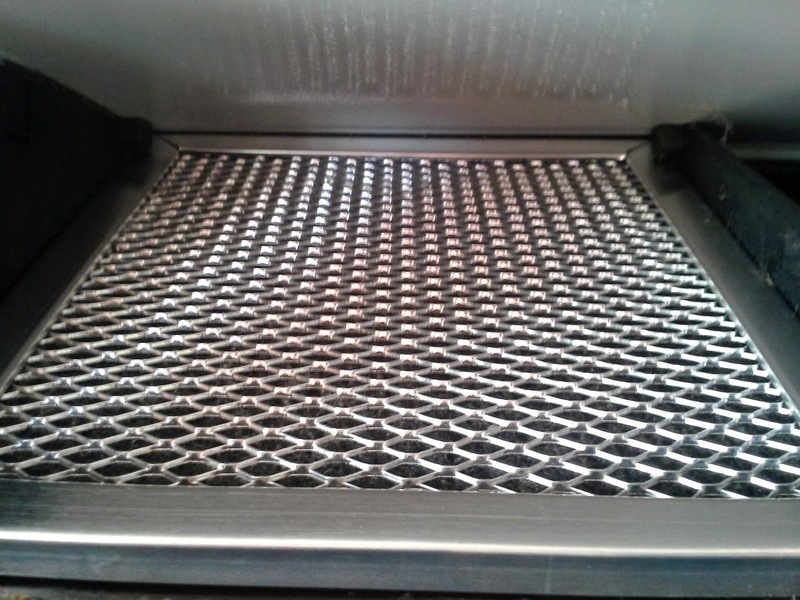 We popped all the filters back into the places and snapped the grill back into place. The whole microwave was gleaming with clean pride. 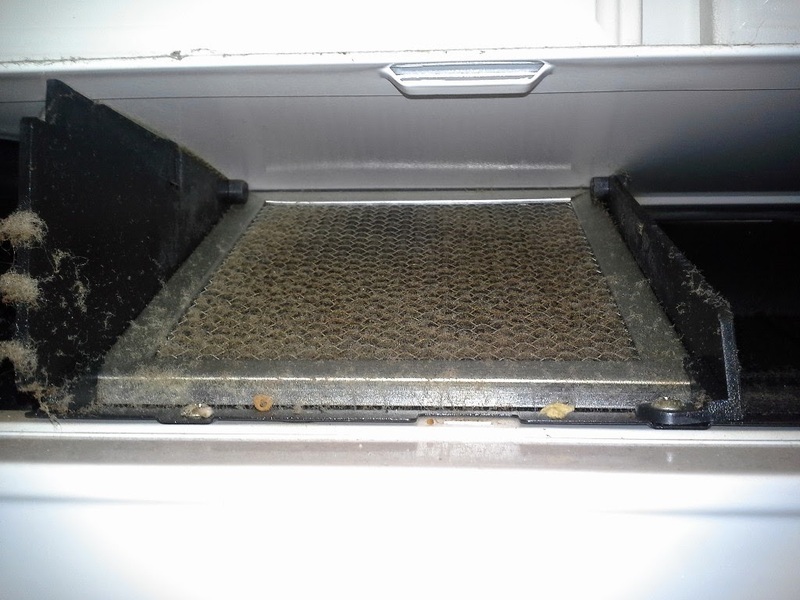 Of course, you can't clean the outside, and the deep dark never before seen before inside filters, and not clean the regular inside of the microwave where the food goes. For this we put 1 cup of water and 1/2 cup of vinegar in a large glass bowl and microwaved for 3-5 minutes, which will boil the water and create steam. Once the timer dings, you let it sit and let it steam in there for another few minutes. 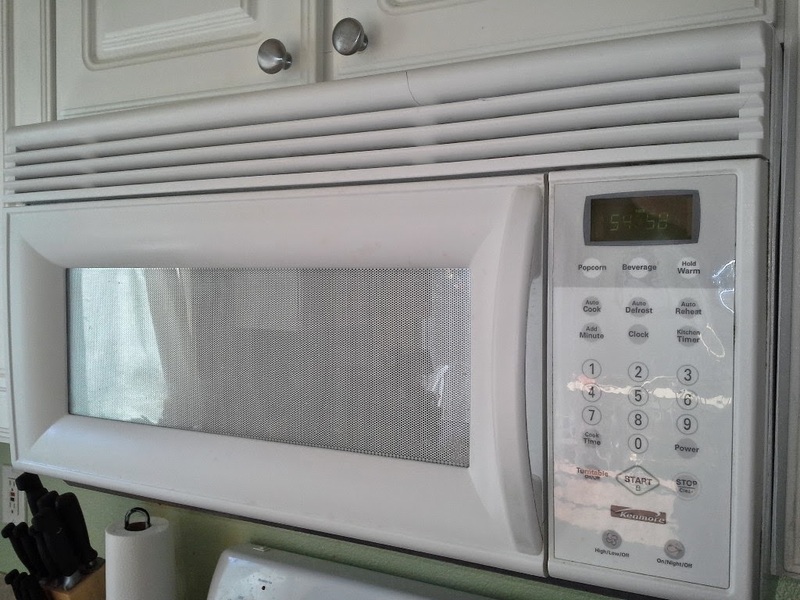 When the water is a little cooler, open the microwave door, wipe down everything with a cloth or paper towel. Not too shabby. Clean and disinfected too! I decided to blog about this because I was completely unaware of those filters in and under the microwave. How I missed this little tip in home ec class I will never know. 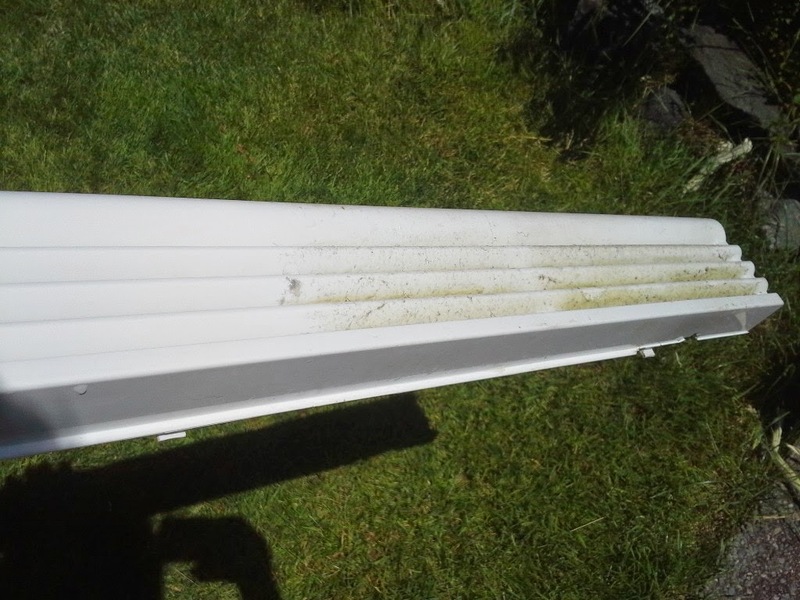 Obviously grease and fuzz building up over time could possibly lead to a fire hazard and I wanted to pass these tips on to anyone else who might not even realize they were there and could be easily cleaned. Also, I am so please with how my grill looks now. I so wish I would have figured this out years ago, but so glad we could at least make it happen now and get such wonderful results. Seriously I can't stop staring at my super clean microwave every time I saunter by it in the kitchen. It's like NEW!! I keep exclaiming to my hubby. And to think... I have a leaky sink and a new faucet to thank for all of this. God bless the chain reaction weekend!! This sounds like a nightmare! 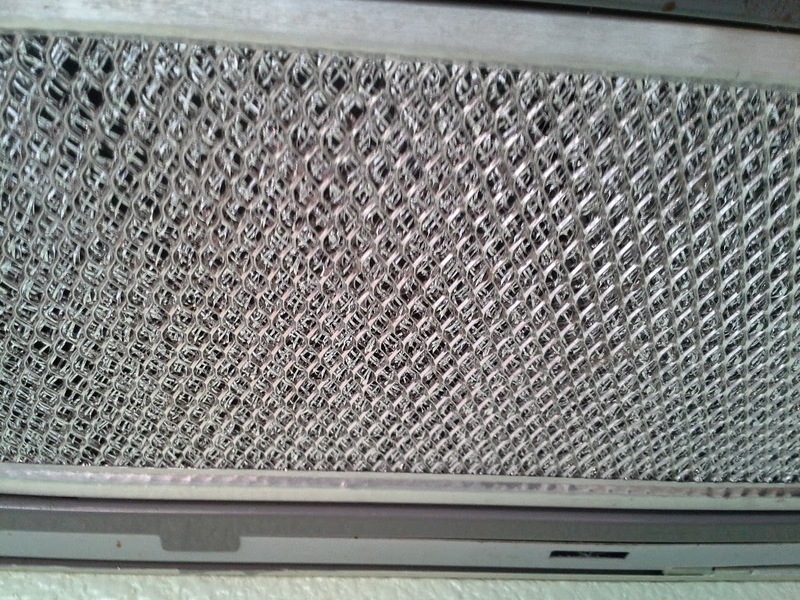 Replacing your carbon filter should be enough to get rid of any smell. Thanks for sharing. It's just amazing how you managed doing that. Honestly it looks like a new microwave- it's amazingly bright. There is nothing better then clean microwave. 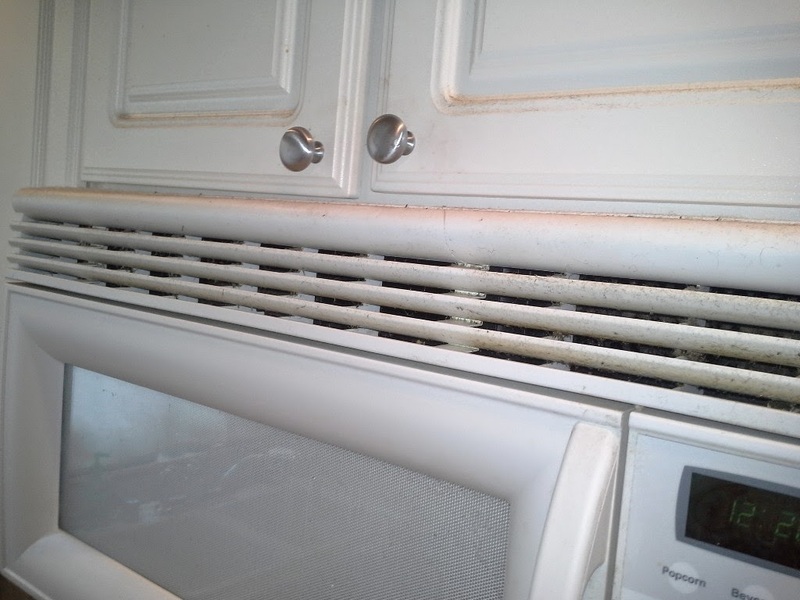 We have the same microwave and I have been trying to figure out how to clean those dang vents! Thank you SO much! I was about ready to go buy a new microwave! I will definitely be trying this. Thanks so much. thank you so much for your tips! I have grease dripping on the inside from the round plate inside the microwave's ceiling. Any idea about it? So gross! Ohhh....Screws on TOP of the microwave!!?? [....sets down prybar] Thank you!! Bahaha... Kim B... that cracked me up. Happy cleaning! I started this project while cleaning for company. Thanks so much for the tips! I'm on my way to "clean." Great blog. Your blog is interesting and so informative. Wait for your next blog post. Thanks for sharing with us. We have the same microwave and I have been trying to figure out how to clean those dang vents. Thank you SO much.I was about ready to go buy a new microwave.